Did you know that July is National Watermelon Month? Nevermind the fact that it’s probably national a-bunch-of-other-things month as well. There are few fruits that say summer better than a big, juicy watermelon. That fact has been slightly cheapened now that seedless varieties are more prevalent and a good ‘ole seed spitting contest seems to be a thing of the past. As a salute to this sweet, refreshing staple of backyard barbecues everywhere, here are three things we discovered about watermelon that may be news to you. 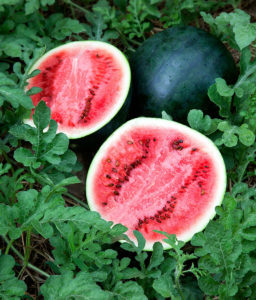 According to Mercola.com both the rind and seeds of a watermelon are edible. They suggest putting the rind in a blender with some lime to get a great portion of the amino acid citrulline. This benefits both your heart and your immune system. The seeds contain zinc, iron, protein and fiber! How many of you stand in the produce aisle at the supermarket knocking on every watermelon until you find a good one? I can never keep it straight. Do the ripe ones sound hollow or is it the other way around? Market Basket Foods puts all of that to rest. The key to a great watermelon is looking for the yellow spot which means that it rested on the ground while it ripened in the sun. Growing watermelons requires a ton of space in your yard. Burpee.com suggests that your lawn is a terrific place. Their instruction is to mix 80 pounds of composted cow manure and 40 pounds of topsoil and build two mounds in the middle of your lawn. Then plant the seeds at the top of each mound. During the summer you’ll have to mow around the vines, but after harvesting the melons, you can rake the soil and manure over your lawn and the result will be healthier, greener grass. If you’re going to grow watermelon this year, there’s no time like the present. According to Almanac.com, they need 80 days to mature with soil temperatures that are at least 70 degrees. Get them in the ground as soon as possible to harvest them by the end of the summer. Anew Green Seed Pacs feature sugar baby watermelon seeds that are always organic and non-GMO. Click here to read further and order Seed Pacs today and be sure to share pictures of your harvest with us on Facebook and Twitter.